Poetry Dare – Can You Poetaster Wags Rise to the Occasion? I found this in a box of antique ephemera today. It’s for the old timey 18th-19th century binocular viewer, stereopticon thingy or something. One inserted it and voila! 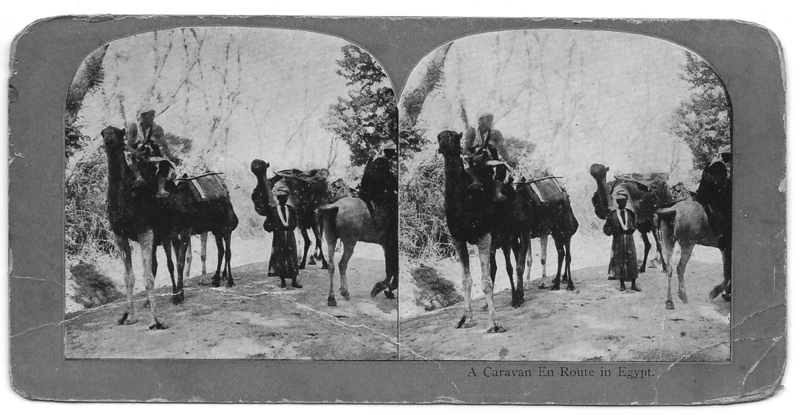 a 3-D tableau of a camel caravan headed for Egypt right before one’s eyes! Those were the days, weren’t they? What do you suppose the camel traders were talking about? Their aching behinds? Their sunburn? Take the challenge and write us a nice little poem about this scene. Something along the lines of “Ozmandias” or “Ode on a Grecian Urn.” Post it in the comments below. The world is waiting. How ’bout a limerick or two too? hahaha! What ho! Shelley, Byron, Keats! Here are some helpful prompts and backgrounders (I didn’t just hatch this versifying inanity out of my own idle fevered brain. It’s a legitamate poetic type. 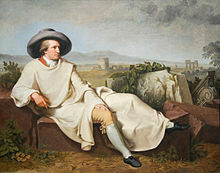 Goethe thought it was one of the highest forms of poetry. What did he know? This entry was posted in Humor, Literature, poetry, writing and tagged camel drivers, camels, Egypt, Keats, Shelley. Bookmark the permalink. 6 Responses to Poetry Dare – Can You Poetaster Wags Rise to the Occasion? here Precarious Steve throws down his stick and hugs the tribal Polaroid. and dream of pulp-free lemonade. and strokes his lovely floral lei. and drops his stick. And leaves it there.